Trent Nelson | The Salt Lake Tribune Utah Governor Gary Herbert gets a standing ovation after getting emotion talking about slain Officer Douglas Barney, during the annual State of the State Address in the House Chamber of the State Capitol Building in Salt Lake City, Wednesday January 27, 2016. 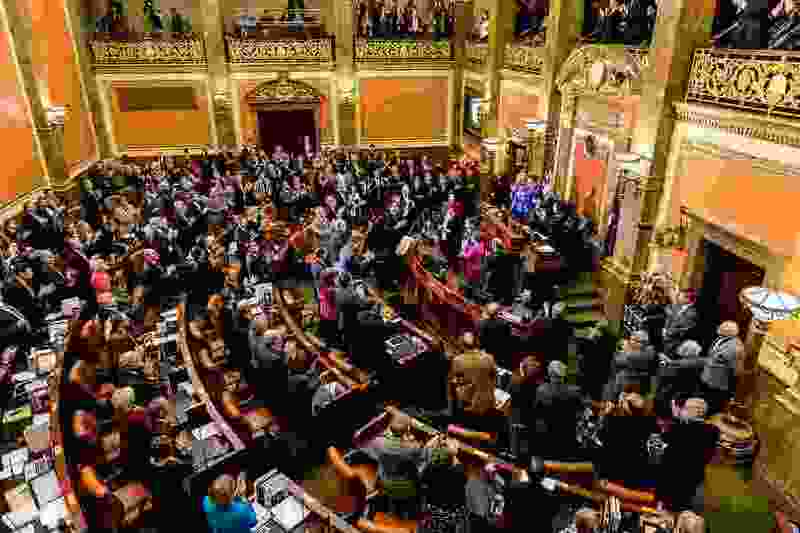 Utah House Republicans announced Thursday a shift in their leadership team because of the recently announced resignation of Rep. Dean Sanpei, who is moving to Colorado to accept a new career position. House Speaker Greg Hughes, R-Draper, appointed Rep. Brad Last, R-Hurricane, to replace Sanpei as the new House chairman of the powerful Executive Appropriations Committee. That also makes him a top member of House leadership. Hughes also appointed Rep. Mike Schultz, R-Hooper, to replace Last as vice chairman of the committee. The Executive Appropriations Committee oversees all spending bills in the Legislature.